One of the first locomotive types introduced by Ivatt, the first batch of ten GNR C2 (LNER C12) locomotives were built in 1898 for hauling suburban services in the West Riding. These were very successful, and a further fifty were built to operate London suburban services to replace the older and smaller Stirling 0-4-4Ts (LNER Classes G1 and G2). The total count of sixty C12s were built in six batches of ten each, between 1898 and 1907. Initially, the design incorporated a rigid 'translated' trailing axle with outside plate springs. The first locomotive No. 1009, was fitted with this feature, but it does not appear to have been very successful. No. 1010 may have also been initially fitted with the translated axle, but all of the other C12s were built with a more conventional radial truck design. It is thought that No. 1009 was converted to use the radial truck design, but no official records exist to confirm this. The C12's boiler was of the same standard Ivatt domed type which was used on the D4, E1,J4, and J50 classes. The working pressure varied over time between 170psi and 175psi. The fifty C12s built for London services were initially fitted with condensing gear for operating the Metropolitan Widened Lines. The first locomotives had a condenser pipe leaving the smokebox just above the boiler handrails and continuing to the front of the water tank in a continuous line. This was brass with a cast iron elbow into the tank. Later locomotives had the entire pipe made of cast iron, and extended down to the bottom of the smokebox (see picture). This arrangement became the standard for all condensers fitted to Great Northern (GN) locomotives. The London suburban traffic was growing rapidly at the turn of the century, and a large 0-8-2T (LNER Class R1) was introduced in 1903 to replace the C12s on the heaviest trains. These were not a great success and in 1907 they were replaced by an 0-6-2T (LNER Class N1) design for the heavier services, with the C12s continuing to haul the lighter services. In 1920, Gresley introduced his N2 0-6-2T locomotives which finally displaced the C12s from London suburban services to various country districts. At Grouping in 1923, only five C12s remained in the London district. As they moved away from London, the condensing gear was removed and blanking plates were fitted over the smokebox holes. 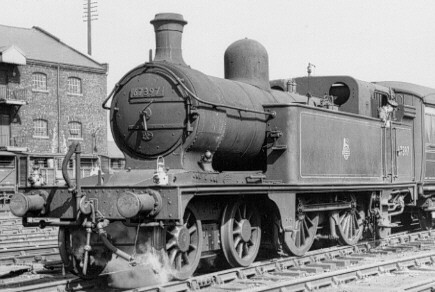 The first eleven C12s had high chimneys and tall domes, but the remaining 49 had smaller chimneys and lower domes to fit the Metropolitan loading gauge. In later years after their movement away from London, boilers would be swapped resulting in various chimney and dome combinations. Early locomotives had square shaped water tanks, and square bunkers. Later locomotives had rounded tank ends, and bunkers with flared tops. Over time, the first C12s had their bunkers altered to have the flared type. Initially both bunker types had two coal rails, although these were often increased to three or four. Eventually all of the rails were filled with steel backing plates. Allocations during LNER ownership were mainly to the West Riding and Lincolnshire. Two C12s operated as station pilots for Peterborough North. Hatfield kept five C12s for London services during the 1920s. From 1930, ten C12s were moved to Hull (Botanic Gardens shed) to replace G5 0-4-4T locomotives on local passenger services. In 1937, two C12s were allocated to Yarmouth Beach and had tablet catchers fitted for operating on the Midland & Great Northern (M&GN) single track. Withdrawals started in 1937, and a total of ten had been withdrawn by the outbreak of war in 1939. With a wartime shortage of motive power, withdrawals were postponed. Wartime allocations were widespread and included Manchester for working services to Wigan, Warrington, and Chester. Although disliked by the Great Central (GC) men on these services, they performed admirably pulling trains heavier than their design capacity. In 1946, one C12 moved to Hornsey to operate as a stationary boiler. Proper withdrawals started again in 1947 with one locomotive withdrawn, leaving 49 to enter British Railways (BR) ownership in 1948. Despite rapid withdrawals, between 1948 and 1949 five C12s were fitted with push-pull gear for services from Kings Cross to Alexandra Palace; from Bulwell Common to Annesley; and from King's Lynn to South Lynn. The last sixteen C12s were withdrawn in 1958. The last C12 Atlantic was withdrawn in 1958, and none survived into preservation. Craftsman have sold an etched kit of the C12 for OO gauge (4mm scale) but availability is unknown. Southeastern Finecast and London Road Models both sell C12 kits for 4mm. Meteor Models sell a kit of the C! @ for O (7mm scale); and ACE Products sell kits for both 4mm and 7mm. Thank you to the P.H. Groom collection for permission to use the above photograph of BR No. 67397. Thank you to Malcolm Peirson for the photograph of GNR No. 1505 with condensing gear.